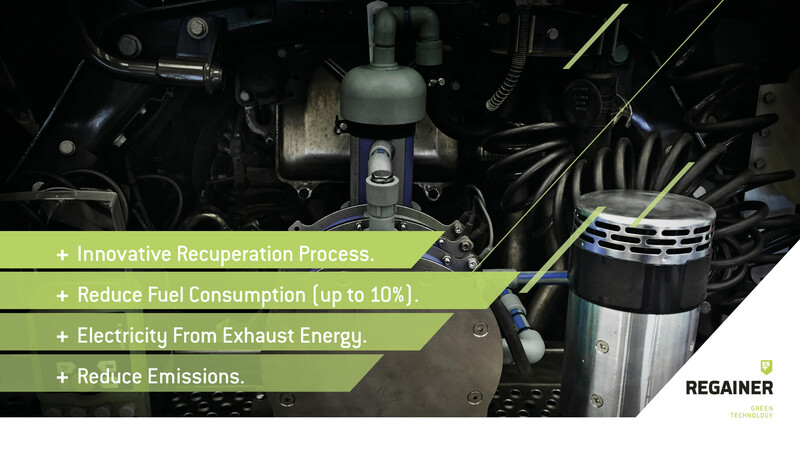 FS REGAINER+ is a patent pending solution for energy recuperation from the otherwise unused exhaust gas pressure in vehicles in non-load periods (during breaking & not accelerating phases) to relieve the alternator in order to further reduce fuel consumption and produce free energy of up to 5kw. It reduces the fuel consumption and the emissions, while providing a surplus of energy that can be self-consumed or used to power i.e. 2 houses or electric cars or fed into the grid against reimbursement. The calculation is simple – the more power (in the form of electricity) your truck, your structure and the driver needs, the higher your diesel savings will be. The output of formerly expensive diesel driven alternator is mostly substituted by the FS REGAINER+. At average reduction in diesel consumption of about 6%, an average truck with 150,000 km annual mileage saves about 3,000 euros – every year! 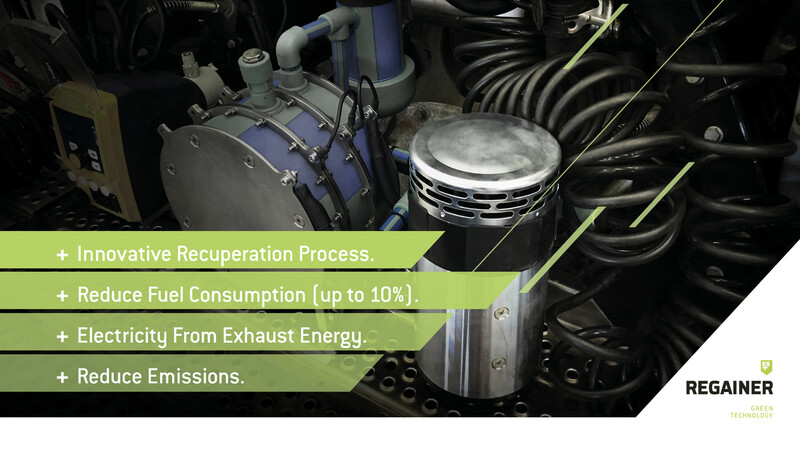 The electricity generated from unused exhaust gas is used to free the alternator and save fuel, while the surplus can be sold to external users to generate income. At an assumed 10 kWh to 260 days per year and about EUR 0.25 per kWh selling price your vehicle feeds electricity for 650 Euro / year. The FS REGAINER+ is not only economically attractive as outlined above, but also reduces the emissions produced by the vehicle and delivers a better overall energy efficiency of the system / vehicle. Do you operate commercial vehicles with high mileage and are keen to optimize your profits? Do you use or require considerable amounts of electricity for your operation? Do you like to add to an environmental friendly image of your company? Please do not hesitate to contact us, we look forward to hearing from you.